This is a little companion piece I shot the other day for a Care2 series on plastic bags I'm working on. Still working on this whole upload procedure to make these look better, but the info is there at least. You can also catch it on Youtube. Thanks for making this video, Dave! It's great! One question: about the biobags, I thought I heard that these bags that supposedly break down won't really do so in a landfill...? True/false? I hope they really do, but I'm getting more and more cynical about some of the products that call themselves "green." Good question. As i understand it something like this that is truly biodegradable will break down. Most plastics that say they are biodegradable are actually photodegradable so in a landfill they won't break down. I should actually chuck one in the worm bin and see what happens. According to their website, the bags are super certified as compostable so I thknk that means they are the good kind. I have not had a chance to watch this particular video, but I did have one question. All of the emphases seem to be on grocery bags and their use. Is anyone addressing garbage bags? These bags are what hold the trash for most of us. As of yet, I have not seen any viable alternatives to plastic garbage bags for household waste. Just thought that I would ask for my own edification. By the way, I have been watching the site ever since I heard about it on KROQ and it has really changed the way that I look at things. Thank you for your invaluable service in education and awareness. I use biobags for my dog as well. I thought the might not hold as well as BagsOnBoard or other plastic alternatives. They do! And at my local pet food store, 50 of them cost the same as 60 BagsOnBoard. Not that much more expensive! Finally - a way to eliminate those irritating plastic fruit and veggie bags. Thank you - I always feel a little strange loading my plastic bags into my reusable bags. Hey Devin, Thanks for the post. I actually mention bags in the vidoe (I think) but biobags makes plastic alternatives. 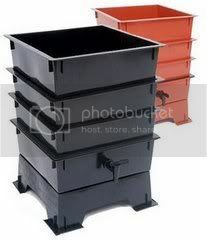 Also, why not start a worm composter and put all your food scraps in there. Then you can just go bagless! Dave, great to see/hear what you're doing. My worry about the corn based bags (to say nothing of bio-fuel) is that not only does it divert agricultural land from food production, thus increasing food prices, but also diverts attention away from the principle of reducing use and thus waste. When there is a way of buying one's way out of having to reduce one's use/waste, I fear that easier route gets taken. Obviously I think that more recognition need to be paid to the idea that many of our corn/soy based bio alternatives, aren't real alternatives. We have to remember that agricultural land is limited and that affordable wholesome food should be more important that a tank of bio gas to get to the supermarket to fill corn-based bags full of unaffordable food, for those that can afford it. Thanks for the comment and I'm basically in agreement with you. I drive a used veggie oil car and when i speak, the thing I always make sure to mention is that food should be grown to be eaten and not used for transport and then segway into EVs. That said, i think that having intermeddiate alternatives to help ease people away from consumptiona dn using plastic is a good thing. Not everyone is going to go cold turkey so i like the idea of giving them a better alternative for the short term. Than once they've realized that they can change their habits, they can go to the next level and go completely cold turkey. By the way, do you know of any studies comparing the problems with full lifecycle of a plastic bag versus a full lifecycle of a corn based bag? How about if I want to get meats for instance? I vaguely remember someone bringing tupperware or ziploc bags, but the butcher seems so much more eager to use their plastics bags it's hard for me to stop them putting into another thing before I hand them my box/bag. Also, how about using paper bags for dog poo? I don't know about butchers, but the fish guys I go to are fine with my tupperware. Took a time or two and I always hand it to them before I order. Explain to them that it's easier on you, the environment, and saves them money and see what they say. Paper bags will break down, but they use trees to make. Not sure how that stacks up against bio-bags, but I'd think that both are better than plactic. I linked to your blog via a post on time.com, and have enjoyed reading about your commitment to green living. While use re-usable bags for groceries, etc., there was one convenience that plastic bags provided: poop scooping! Our city has a pooper scooper law, and fortunately our neighborhood is very good about scooping up pet waste. I hose down the piles in my own yard, but when we go on long walks with the dog, there's nothing like a plastic bag to collect her 'gifts'! Can you make good suggestions on any part of the poop cycle (waste deposited at home and that deposited on walks? Hosing down seems wasteful now that I think about it, but a yard full of poo doesn't seem so lovely either. Biobags are a good resource for poop bags and there is also a dog poop composter out there that I've heard works well but i haven't tried myself. It's a common problem. And while biobags will cost you a bit, does it make sense to throw all that plastic in the landfill just cause it doesn't cost you out of your pocket? great the tee shirts idea, cause we can't buy the other baggies overhere! I just want to say that I love your site. I myself have been trying to cut down on waste and must say it has been pretty successful. My family has gone from 2-3 bags of garbage a week to just 1 and sometimes less. I am very proud. One hurdle I have come across is with my 5 year daughter who is in kindergarten. We pack lunch every day and I use reusable plastic containers. She has told me that she is unable to open the ones for snacks and begs me to please put them in baggies so that she may be more independant. There is always someone there to help her if she simply raises her hand during lunch. I explained this to her and she still says she really wants to be able to do it by herself. So, I started sending baggies. Any suggestions? The other things is, I hate the amount of waste her school goes through. Grrr. Everything goes into the garbage. Every plastic bottle that has one sip out of it right into the garbage. Every uneaten sandwhich, every bag of chips (opened or not). Right into the garbage. Any suggestions? I don't understand the recycling of the egg cartons... eggs are packaged in the cartons so how would saving your old one help in reducing the waste? Great question. Funny how when things become normal you kind of forget that not everyone is doing what you are doing. We get our eggs at the farmers market whenever possible so we ask them to fill the cartons back up. First off, thanks for the kind words. I have a four year old and a six year old and I hear what you are deaing with. For starters, I;d say her independence and feeling comfortable are probably more important at this stage than a few plastic bags (and you can offset that by taking on some other challenge). At the very least you can re-use the plastic bags over and over. We have little plastic bag line hanging above the sink and re-use them over and over again by washing them in the sink. It's a pain, but ziplocs do come in handy from time to time when you have kids. On the school front my first piece of advice is to take it slow. Find some other likeminded parents and/or even a likeminded teacher and pick one thing to work on until you have figured it out. Come to them with solutions and they'll be more psyched than if you come to them with problems. Do they have a science teacher? What about starting a worm bin that the kids can feed? My 4 year old has a very earth friendly teacher and they have snacks during the day. She decided that she couldn't deal with all the tossed stuff and so she got heavy duty plastic cups and bowls and washes them in the little sink. A few other teachers are starting to as well. Let me knwo if you have ny specifics and Ill be glad to help as I can. We no longer use towels, and that saves lots of water and energy by not having to wash them. You can shower and shake off (learn from the dog) and your dry clothes will soak up the last few drops. Dishes air dry in the rack. Next challenge is to get used to cold showers. I have learned to shave dry (no shaving cream or water) and that helps too. Using no towels may work in a dry climate, but in high humidity, getting dry in a reasonable time can be a problem. Bags: I have made drawstring bags to use for bulk groceries (I keep them in my backpack). The grains and especially cereals are cheaper this way (about half of the price of a box of cereal is for packaging). I also reuse what plastic wrap I cannot avoid by rinsing and drying it and stuffing a large pillow with it. My cats sleep on this object and I have been stuffing it for over five years without running out of space. As the stuff compacts, there has always been room for more. The plastic doesn't absorb liquid when they foul it, and I just have to sponge off the cotton cover. When I had a dog, I made a commode for her walks, consisting of a handle broken off of some deceased implement, and an embroidery hoop that I was not using as intended. The hoop held a plastic bag semi-permanently, and I lined it with multiple layers of folded newspaper. Each time the dog dumped, I stuck it in position to receive, and folded the edges of the top layer of newspaper down over the results. I didn't have to pick up anything, and the paper-wrapped droppings went into a covered barrel with perforations in the bottom, where I layered them with compost to encourage decay. When full, the barrels can be left to rot for a couple of years and then planted with decorative foliage on top of a new layer of soil to fill in for the shrinkage that comes with decay and to give the plants better nutrition. I used bulbs--asters of some sort. @Devin - You were asking about an alternative to garbage bags. Well, I'll give you mine - I just don't use any. I produce very little trash, so it ends up in a grocery sized bag about once a month. Just put that out by the curb and off it goes. There's no requirement anywhere that I'm aware of that your garbage has to be in black bags. You can also get one of the hard plastic or metal garbage bins. Those often have wheels which also make things easier. Thanks for your tips. Regarding the small, mesh produce bags. Do these allow for good storage of the produce in the fridge? I currently use/reuse the "green" bags which definitely keep produce fresher longer in the fridge. How do the mesh bags compare? When I try to put produce with no bags in my produce fridge drawers, they wilt immediately. Thanks for any science on the mesh bags as produce keepers. Thanks Dave. We do all of the things you suggest. We try to pass the word along but now we can share your video. For bulk foods and produce, I've been using small nylon bags that I get through an Etsy shop, made by a gal in B.C. Canada. They're perfect! No weight to them. The Care2 post was terrific. Again, thanks! The mesh bags do not do as well in the fridge I must admit. We tend to buy and eat pretty quickly but I see your point. Guess I need one more part to the equation. I'll start looking. Why can't we do things like the old days? Pre-plastic bags, we use to line our trash cans with newspapers on trash day they just picked up the newspaper lined cans and just dumped everything in the truck . Thanks, Dave, for making us all more aware. Once I saw the news report of your saving trash for a year, I started taking reusable bags to the grocery store and I haven't looked back since! My family is taking on more waste saving/conservation ideas along the way. Dave, what drove me to write today is that although Walmart sells the resusable bags, the cashiers practically sneer at me when they see me coming. I overlook the attitude, but it gets discouraging sometimes. Any suggestions on dealing with the resistance that we "conservers" run into? Hmmm, I haven't actually run into this as usually there isn't much of a response at all when i bring out my bags. That said, I'd probably just try to stay with a good attitude and not show them they are getting to you. I usually mention that I'm fine to bag myself (saves them work) and make sure to thank them. Maybe write a letter to the head of the store and without mentioning who, ask why you see this attitude time and again? Let me know what happens if you do. And thanks. nice work you do! I'm from East Europe and waste sorting is low level here. I still live at home and try to tell my family about waste sorting. I already achieved to sort out paper and cardboard, and plastic water bottles. I dont have a drivers licence so it is hard for me alone to bring the stuff to the recycling bins wich are sometimes very messy or full. When I ask other family members to bring the plastics, we often arguing about it ("You wanted so much to sort it out, take care about yourself" or "It's too much effort, pack it all in the car, drive and then pack again")I'm so unhappy about it. I try it so much. When I go shopping with mom she sometimes laughs at me when I refuse the plastic bags in shops. It is so embarrasing because I'm 22, studying biology and still can't do a thing for my environment, becasue my family's a lazy one and it's much easyer for them, throwing everything into the bin, thinking "Bring it out of my sight" and not thinking "oh my god, we produced this much this week?!". It's an uphill battle for sure, but simply by bringing these ideas to the forefront you are doing something good so don't be hard on yourself. Eventually others will see the wisdom in your words. Don't know if you keep up with this anymore of if this was addressed earlier. Your second commenter ever raised a very important question about "biodegradable" items breaking down in a landfill. Biodegradable items DO NOT break down in a landfill because of the way garbage is handled. Due to sanitary requirements, trash will eventually be confined to a hermetically sealed container. This prevents ANYTHING from breaking down and essentially mummifies the trash. A banana peel from 1950 will still be recognizable as such today. If you as a consumer wish to buy biodegradable disposable items, COMPOST THEM, where they have exposure to oxygen and fungi that will turn them into soil. I know this is an old post, but I just wanted to share that rinsing veggies and wrapping them in teatowels or putting them in a cloth bag (muslin or similar) should keep your veggies just as fresh as plastic. Old or not, more good info is always appreciated. Thanks. Wow! That was a great post. It can help many people for our healthy and clean environment. Thank you so much. I really appreciated it. I am a student in Mr.Dillman's AP Earth/Environmental class, and i just wanted to say that what your doing is amazing and very inspirational. On the topic of this video, I just wanted to say that my family has many reusable grocery bags, however, I don't think we have ever actually reused them. (They pretty much just stay in trunk or in our pantry.) After watching this video, I think I might start pushing my parents to use them. Why not make some money while saving the environment??? Wow I didn't realize there were so many easy and simple ways to reduse using those plastic bags. It really is a bummer that it's so expensive to be more eco-friendly. I don't think any place here has a program that if you use a reusable bag you get money for it though so that's a problem with not encouraging to use them. Very informative and helping video though! I really agree with all that you had to say about how easy it is to use reusable bags if you just retrain yourself to do so, I always have my reusable bags by the door and some just in the back of my car. But I really should invest in those mesh bags for produce and corn based kitchen bags.